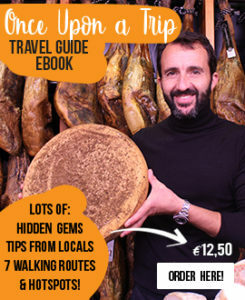 Complete your Valencian experience by using our ‘Once Upon a Trip’ Valencia travel guide (eBook). Get surprised, inspired and fall in love with places well known by the locals! In our digital travel guide you will find always up-to-date information, tips from locals and more in just one PDF document (almost 200 pages!) you can always carry it with you, everywhere you go, on your smartphone, tablet or e-reader. A travel guide filled with the best tips from locals about restaurants, bars, the most beautiful places, good tapas bars but also usefuland practical information. What makes this travel guide special? The true stories about the city, told by real Valencians! Those details, told by them, make Valencia such an amazing city! Explore Valencia’s seven different neighbourhoods and or districts: El Carmen, Ruzafa, Canovas (Gran Via), Pla del Real Benimaclet and Beach and Harbour. With a description of each neighbourhood you’ll also get tips about nice sights, good places to eat or have a refreshing drink! Every description of a neighbourhood contains tips from a local too! Get to meet Ruzafa’s star cook Ricard Camarena, or read about Carlos Boga, the general manager of the five star hotel Las Arenas. There’s more! Within every neighbourhood in the travel guide is also a nice route to walk and a map, so you can walk by all the hotspots and get to meet the locals yourself! You most likely not only just want to see the city, you might also want to get some historical facts straight too! Just some background information to get to know the city better. Why are things the way they are and how did they used to be? 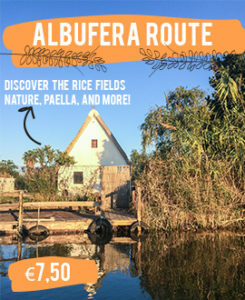 In this Once Upon a Trip travel guide there are five themes to give you some extra information about: history, the City of Arts and Sciences (CAC), Las Fallas, green parts of the city & living in Valencia. Again here, within every theme you will find an interview with a local/specialist of the area. Get to know David Livermore, the art director of Palau de les Arts (the Opera) in CAC and Carmen Sancho de Rosa, the Fallera Mayor of 2014! At this moment, the Once Upon a Trip travel guide (eBook) is not available yet. 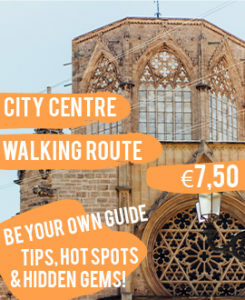 Are you interested in ordering our travel guide about Valencia? Please, send an e-mail to info@onceuponabike.com and we will keep you updated when the travel guide is available! You like to ride the bike? Well, we thought about your needs too! Valencia is the perfect city to cycle around and discover! 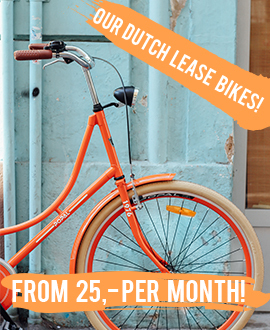 Therefore the eBook also contains a biking route with several stops for good sights, a drink or dinner. Do you love the food you eat in Valencia? Lucky you, the guide contains a nice recipe to take home! Click here to see a preview! The book is surprising, full of unique information and on a local level. Our Once Upon a Trip team made it with love, care and joy. 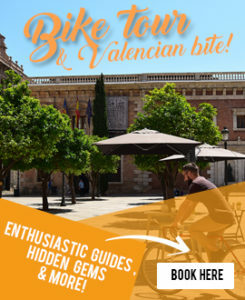 Together we made sure the travel guide contains the best, most pretty and hidden gems Valencia has to offer! Here at Once Upon a Trip we’re constantly apprised of all that happens here. Trends, new restaurants, refreshing places, you name it! We make sure the information you get is always up to date! We think this travel guide suits everybody! And therefore it is “para todos!” Which means “for everyone” in Spanish! Don’t get us wrong, we love historical facts and stories! But we think that there is more to a city, especially a city like Valencia! It’s about the people, the good places to eat and more. We like to make your experience more complete. Light weight and super handy! Don’t take more luggage than needed. Imagine our travel guide to be a real book! That would be heavy, and that’s not what you need during a city trip, right? That’s why we created a digital one, specially for you!